Ready for the next Elvis sighting? 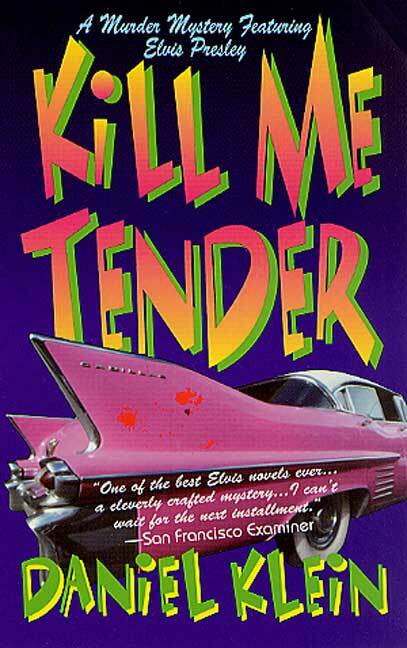 Like all the best supermarket paperback murder mysteries, “Kill Me Tender” has everything – suspense, intrigue, a serial killer, big ol’ Cadillacs and – the icing on the cake, amigos – Elvis Presley as an amateur detective on the decidedly twisted trail of a homicidal maniac with a taste for the bizarre. Trouble starts shortly after a restless Elvis returns from military service in Germany in 1958. He’s haunted by an uneasiness he can’t quite put his finger on. Worse, members of his fan clubs seem to be dropping like flies. Of course, this wouldn’t be all that unusual today. Many diehard Elvis fans are now nearing the latter third of their life expectancies. This story, however, takes place at the height of Elvis’ popularity and most of his fans are still bright-eyed teenagers. But those young fans – despite otherwise good health – are dying mysteriously, the victims of what physicians initially believe are heart attacks. The only clue that links their unexpected deaths is a small red mark on the tongue that resembles a rose or, perhaps, a ladybug. Before Elvis can slap together a peanut butter and banana sandwich and leap into his black-and-tan Cadillac, he’s neck deep in a convoluted series of killings that defy explanation and a cast of characters that almost defy description. There’s Dr. Billy Jackson, gospel-singing founder of the William Preston Jackson Clinic who has everything he needs to run a successful medical practice except a medical degree; and his sultry assistant, Miss Selma du Pres, with whom Elvis is immediately smitten. Then there’s Carl Miller, father of one of Elvis’ slain fans, who believes his daughter’s death is somehow tied to a Jewish conspiracy involving the town’s druggist and the pharmacist’s son, who may or may not have been one-half of a suicide pact with Miller’s late daughter but didn’t die. Worse, Miller’s wife ruthlessly boils chicken and then doesn’t even put any barbecue sauce on it. To complicate matters, Elvis also has to deal with the somewhat identity-challenged Rufus Johanssen, the husband of another murdered fan. Rufus is also a fanatic Elvis impersonator. So fanatic, in fact, that he begins to imagine that he is Elvis and that Elvis is actually impersonating him. A likely suspect, but only one of many. And Elvis is running out of time. Will he be able to find the murderer, stop the killing and still make it to the recording studio before Col. Tom Parker has a conniption fit?